With generous room, smart styling, available all-wheel drive and confident performance, the Chevy Equinox continues to be one of the standouts of the compact SUV segment. Those attributes are enhanced for 2008 with the new Equinox Sport, a performance-oriented variant that delivers a serious dose of driving fun and style. The Equinox Sport has an aggressive stance and a sporting nature, thanks to a lowered suspension, bold 18-inch wheels, a powerful, 264-horsepower (197 kW)* DOHC engine � backed up with a six-speed automatic transmission with manual tap up/tap down control. Equinox Sport also feature hydraulic power steering, a tuned exhaust and unique interior and exterior appointments � all of which contribute to making Equinox Sport an uncompromising performance vehicle. Front-wheel-drive and all-wheel-drive models are available. In addition to the Equinox Sport, a new Equinox LTZ model joins the lineup. Changes made to �08 Equinox models include the relocation of the compass readout from the inside rearview mirror to the driver information center (on models so-equipped), and three new exterior colors: Navy Blue Metallic, Black Granite Metallic and Golden Teal Metallic. OnStar is standard on �08 Equinox models. OnStar-equipped Equinox models are equipped for Turn-by-Turn Navigation, the first factory-installed, fully integrated GPS navigation system from OnStar. 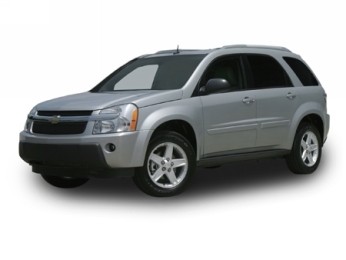 Equinox features an enhanced ride and handling package for 2008 that includes stiffer shocks, hydraulic bushings and tuned spring rates. Also new for 2008 is Electronic Trailer Sway Control � a feature that is integrated into the standard StabiliTrak system and detects the occurrence of trailer sway that may be caused by improper trailer weight balance or excessive vehicle speed. Upon detection of trailer sway, StabiliTrak will begin to apply brakes individually, independent of the driver applying the brake pedal, to assist the driver in stabilizing the vehicle, and the StabiliTrak activation telltale will flash to signal the driver to reduce vehicle speed. If trailer sway continues, StabiliTrak will reduce engine torque to reduce the speed of the vehicle. Standard safety features include StabiliTrak electronic stability control system, standard four-wheel disc brakes with ABS and tire pressure monitoring system. Head curtain side air bags are available. Equinox provides a well-equipped package of comfort and convenience features, including: standard five-passenger seating, power door locks with remote keyless entry, power windows, air conditioning, tilt steering, rear liftgate with defogger and washer/wiper, fold-down front passenger seat for longer cargo items and sliding rear seat with a 60/40-split seatback and two-position recline. The five-passenger Equinox is one of the few compact SUVs equipped with a standard V-6 engine. It is powered by GM�s 3.4L V-6, rated at 185 horsepower (138 kW) and 210 lb.-ft. (285 Nm) of torque. This durable overhead valve engine is coupled to an electronically controlled five-speed automatic transmission. It�s a powertrain combination that delivers smooth, strong acceleration along with reduced highway cruising engine speeds for excellent fuel economy. Customers can also opt for an on-demand all-wheel-drive system, which delivers power to the front wheels during normal driving conditions but seamlessly transfers a portion of the power to the rear wheels if front wheel slippage is detected. While primarily intended for on-road use, this AWD system also provides excellent traction and mobility for off-road use. Equinox�s standard Multiflex sliding rear seat can be moved nearly eight inches (203 mm) fore or aft, as well as reclined. In the aft position, this seat provides generous legroom for three full-size adults and a split seatback with two recline positions. With the seat all the way forward, Equinox offers 67.1 cubic feet (1,900 L) of cargo space. Because the rear seatback has a 60/40 split, Equinox can transport up to two rear passengers along with long cargo items. The front passenger seat folds, further extending cargo room length. When folded, the hard front seatback can be used as a table or desktop. Equinox has a comprehensive list of standard comfort and convenience features, including a ir conditioning, 16-inch aluminum wheels, fold-down front passenger seat, manual height adjuster on the driver seat, daytime running lamps, f olding outside rearview mirrors, p ower door locks, mirrors and windows; remote keyless entry, dual front map lights, cruise control and AM/FM stereo with CD player with six-speaker audio system. A Driver Information Center (DIC) is standard. Located in the instrument panel cluster, the DIC includes more than 20 personalization and vehicle information features, such as tire pressure, trip odometer, fuel range, outside temperature display and door locking/unlocking features (uplevel models) � all standard. Additional available features include l eather insert seating, heated front seats with either leather insert or cloth trim, leather steering wheel with radio controls , six-way power driver seat with manual lumbar adjustment, self-dimming inside rearview mirror, power sunroof with shade, two different 17-inch aluminum wheels and XM Satellite Radio (continental U.S. only). The Equinox Sport delivers a performance-inspired appearance, with specific body colored front and rear fascias and a body color grille cross bar. The front and rear fascias have trapezoidal design cues; the front fascia uses silver-painted trapezoidal air inlets, while the rear fascia features dual chrome trapezoidal-shaped exhaust outlets. The Equinox Sport�s performance-oriented look is enhanced by eliminating the roof rack, although it is offered as an option. Also, 18-inch flangeless, high-polished forged aluminum five-spoke wheels, mounted on P235/50R18 tires, complement an aggressive stance. Inside, the Equinox Sport has standard all-Ebony trim and appointments all its own. New heated seats with bolsters covered with Sport-specific unique cloth are standard, with perforated leather-covered versions available. It also has a leather-wrapped, four-spoke steering wheel and specific instruments, including a 140-mph speedometer. The shifter also is unique to the Equinox Sport, its J-gate design enables precise control of the six-speed transmission�s fully automatic or manual tap-up/tap-down features. Standard features also include those for which the Equinox is already known and appreciated: five-passenger seating with a Multi-Flex, split-folding rear seat, fold-down front passenger seat , power door locks with remote keyless entry, power windows, air conditioning, tilt steering, rear liftgate with defogger and washer/wiper, and an AM/FM/CD/MP3 stereo with six-speaker audio system. XM Satellite Radio, remote vehicle starting and heated front seats are also standard. Available options include a power sunroof, a Pioneer seven-speaker audio system and heated, leather-appointed seats. Equinox Sport is powered by a high-feature 3.6L V-6. It is a DOHC engine with variable valve timing that delivers 264 horsepower (197 kW)* and 250 lb.-ft of torque (339 Nm)* � a 42-percent power increase over the Equinox LT. The 3.6L engine is paired with a new Hydra-Matic 6T70 six-speed automatic that provides an excellent balance between performance and fuel economy. This powertrain combination helps deliver an estimated 0-60 mph time of less than seven seconds. The Equinox Sport�s performance is complemented with hydraulic power steering and a performance-tuned suspension. A long, 112.5-inch (2,857 mm) wheelbase and wide, 61.8-inch (1,569 mm) track give the Equinox a stable, confident road feel, while the Sport�s lowered ride height, specific shock tuning, control arms and larger, solid stabilizer bars add to its more responsive, sporting driving experience. The overall ride height is reduced by about 1 inch (25 mm). The front suspension has a MacPherson strut design with new control arms and stiffer, hydraulic bushings and slightly stiffer springs. The front struts have internal rebound springs that improve roll stiffness and steering sensitivity, while maintaining ride comfort. The rear suspension features a four-link independent layout with stiffer bushings. GM�s innovative StabiliTrak electronic stability control system with Electronic Trailer Sway Control, front and rear disc brakes with four-channel ABS and tire pressure monitoring system all are standard on the Equinox Sport � as they are on all Equinox models for 2008. On AWD models, the automatic all-wheel drive system has no buttons to push. It engages automatically when wheel slip is detected. New for 2008, the LTZ model is differentiated from other Equinox models by its 17-inch bright chrome-clad aluminum wheels, bright chrome door handles and bright chrome luggage rack side rail inserts. Standard interior features include heated front seats, leather seating inserts, head curtain side impact air bags, AM/FM stereo with six-disc in-dash CD changer and MP3 CD playback capability and a Pioneer premium seven-speaker audio system. Equinox LTZ also features the same enhanced ride and handling package as LS and LT models. Equinox has one of the longest wheelbases in its class and is built on an optimized body architecture that helps provide a confident driving experience. The structure is complemented by an independent MacPherson strut front suspension and a four-link coil spring layout in the rear, for a smooth, comfortable ride typically associated with larger SUVs. The rear suspension has a trailing arm as well as three additional locating links to facilitate a low, wide load floor and to maximize rear passenger space. Electric power steering is standard on LS, LT and LTZ models; it helps provide precise steering control and performance, as well as enabling improved fuel economy because there is no engine-driven power steering pump. An electronic control unit, calibrated for a variety of desired performance characteristics, controls an electric motor mounted on the steering column to provide the precise amount of assist needed for any given driving situation. Its variable-ratio steering delivers a responsive feel during highway driving and low effort for easier parking. All Equinox models also are equipped with vented front disc brakes with dual piston calipers and rear disc brakes. Anti-lock brakes and traction control are standard. Standard dual-stage frontal air bags with GM�s passenger sensing system and safety belt pretensioners complement a strong safety cage construction of Equinox. Dual-stage frontal air bags are designed to help reduce the risk of air bag-induced injury. The passenger sensors, located in the seat cushion, adjust the air bag deployment speed based on the occupant�s weight. Pretensioners in the front safety belt system deploy at the same time as the frontal air bags to take up slack in the safety belt webbing. Pretensioners also help reduce the amount of occupant movement in the event of a crash to help reduce the risk of injury. Optional head curtain side air bags act like a protective curtain when deployed, unfolding from the roof rail between the A-pillar and side window header to help provide protection for front- and rear-seat outboard passengers. The rear seats are equipped with the LATCH (Lower Anchors and Tethers for CHildren) system anchors for child safety seats. This system provides two lower anchors and a top tether anchor in all three rear seat positions to be used to secure a child seat to the vehicle seat structure. These anchorages are designed to make it easier to properly install compatible child safety seats. Chevrolet makes information about child safety seat installation more accessible to consumers shopping for a vehicle. Specific pages on the Chevy web site tell customers exactly how many car seats a vehicle can hold, where the seats can be placed, and where to find the LATCH hardware. The child seat web pages can be accessed from the main vehicle sections of the Chevy site (www.chevy.com) or directly at www.chevy.com/childseats. Standard StabiliTrak electronic stability control system with Electronic Trailer Sway Control helps drivers maintain control during sudden maneuvers or in low traction conditions by using a comprehensive series of sensors to measure acceleration, deceleration, steering angle and yaw rate. By monitoring these inputs, the system automatically controls the vehicle to help maintain the driver�s intended path when a measurable deviation from the intended course is detected. The system maintains control by regulating vehicle acceleration or applying the brakes at any wheel. Electronic Trailer Sway Control is integrated into the StabiliTrak system and detects the occurrence of trailer sway that may be caused by improper trailer weight balance or excessive vehicle speed. Upon detection of trailer sway, StabiliTrak will begin to apply brakes individually and independent of the driver applying the brake pedal, to assist the driver in stabilizing the vehicle, and the StabiliTrak activation telltale will flash to signal the driver to reduce vehicle speed. If trailer sway continues, StabiliTrak will reduce engine torque to reduce the speed of the vehicle. Equinox also has a standard tire pressure monitoring system. It alerts the driver when a significant reduction in pressure occurs in one or more of the vehicle�s tires by illuminating a warning light on the instrument panel. The low tire pressure warning remains on until the tire pressure is corrected. OnStar-equipped Equinox models are equipped for Turn-by-Turn Navigation, the first factory-installed, fully integrated GPS navigation system from OnStar (additional monthly fee required). Turn-by-Turn allows consumers to talk to a live advisor, who in turn sends complete step-by-step directions to customers' vehicles through their OnStar system. These audio directions automatically play through the vehicle�s stereo as needed, triggered by the OnStar system�s GPS capabilities. This enables drivers to be led to their destination while keeping their hands on the wheel and eyes on the road. For more information about OnStar, see the OnStar Overview in the Product Information Guide corporate section.